At the beginning of the 20th century, the arrival of the first restaurants and taverns come to the area. Setting the scenery, at the close of the 1960s, the Charles S. Campbell park is established next to the future Bourbon. Between 1990 – 2014, the iconic New Orleans style Le Bourbon establishment quickly becomes the go-to destination for entertainment, dining and lodging in the area. 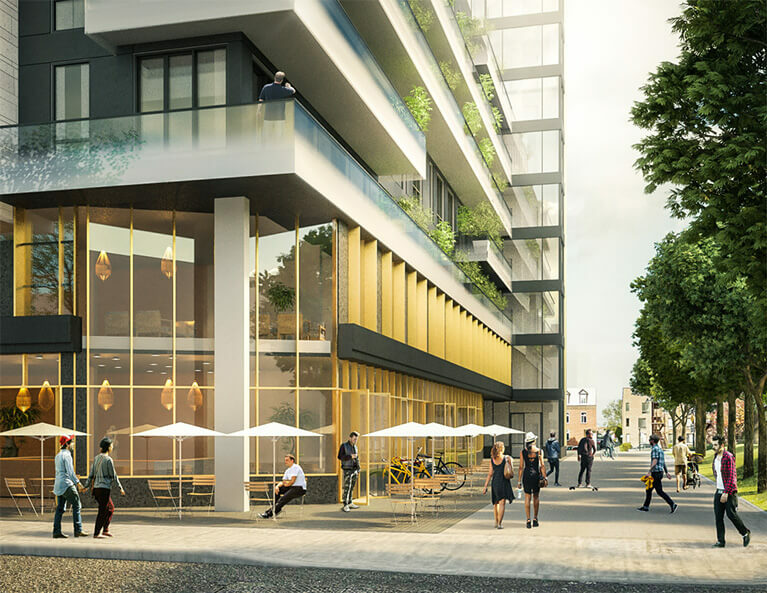 In 2020, Le Bourbon construction is projected to be completed, welcoming its new residents, breathing new life into the area while honouring its famed past. Le Bourbon offers the convenience of city living, the comfort of spacious layouts and the attention to detail that makes a home luxurious. This modern 9 story building offers the best of contemporary design and style, featuring a superior building envelope – comprising white polished brick, natural stone, glass, granite and metal panels. An impressive construction with high end finishings that will change the standards in the area. The ground level will host reputable proximity businesses, adding to the overall convenience of our location and amenities. MSC Investments Canada is built with many years of expertise through successful Investments. Sotheby’s International Realty Canada is the leading real estate sales and marketing company for the country’s most exceptional properties. National Bank is an integrated group that provides comprehensive financial services to consumers, small and medium-sized enterprises and large corporations in its core market, while offering specialized services elsewhere in the world. Atelier Robitaille Thiffault specializes in the areas of urban design, residential architecture, landscape architecture and the intervention on heritage complexes. Alexandre Lafleur Design currently offers custom design services and consultation for private home decor and renovation projects as well as large-scale residential or commercial projects. Interested in Living at Le Bourbon? Let us show you Condo living at its finest in the heart of downtown Montreal.